Dipole centres, trap formers. Free. Hi got a number of these after building the workshop... every unit had 4 of these but didn't use them on most so got about 50 of these. Rather than going into the bin... they are some sort of ABS type plastic and didn't seem to suffer in a microwave. If you have a dipole or windom antenna and need a centre, perhaps with a ferrite rod balun etc then these might suit. The inside diameter is about 25mm or 1 inch with about 5 1/2" or 140mm inside length and the top screws on. There are small holes in the cap (one) and the non screw end which means any water ingress would have an escape... you could fill those if needed though. Free to any that want one, first come first served...but you'll need to send me a self addressed jiffy bag. Note the postage must be a LARGE packet stamp not a first class one. I have seen a few posts on lists about possible 2SCxxxx replacements and chinese fakes and as some know I build a lot and I have used these before I have been asked to test a few supplier options one being the ebay trader most know. I'll put these into a simple TX (the Junk Box Special) and an AB linear and test CW and SSB on bands between 0.5MHz to 30MHz which is where the original 2SCxxxx were used without problems. The results will then be put up here. I might even go as a far as the push pull 2sc2166 linear designs. QSOs :80 and one dupe. I made 80 qso on cw and 3 DXCC during the 4 hour contest, hardly a thrilling rate but added my bit to the group. Was FT897 @ 20W (So not qrp, I tried but at 5W but in a session just prior to contest was confirmed would have had a hard time so increased output to 20w and contacts were possible) to a G5RV centra at 18ft AGL ends about 6ft AGL. Bringing up the rear making 79 qso after 1 dupe 1/2 the count of most and 1/3-1/4 rate of the 'leaders' if I heard some the serials been given out correctly, however, 'cut numbers' confused me a little initially. I recorded the contest (just my audio in/out) and might be worth checking I got the serials right before submitting. Bob (G3PJT) was not kidding about needing sharp elbows, an hour in and you just got stomped on and my 500Hz filter did not seem narrow enough I think I might invest in a 300Hz filter for the FT897 or homebrew something. I heard from another with a IC-7000 the DSP was working overtime to keep everything outside the passband out of their ears, but the AGC was suffering - at times despite basically no audio, the S-meter was showing S9+20. My exchange was often M1KTA 599 my serial PSE CFM their serial TU, so I programmed that into wintest, seemed to be a few exchange variants in use. I think many were more or less on the standard Win-Test set, removing the ++ and -- speed change operators, and sure some stripped down a couple of spaces between RST and serial number. -Speed demons! Also had the usual other macros to send repeats of the serial number, "NR? ", their call, our call and so on, but the ones above were the normal set. I think it is possible to run wintest to do a lot of this automatically but being a bit dim to set it up correctly. No doubt not confirming I heard their number correctly will lose a few QSOs in adjudication, in combination with CWGet's attempt, I had two values to choose from. If both were the same, we were happy; if differed, I asked for a repeat! I gave up trying to cq as I was too slow for those that responded even about 3.580. I have to say, most stations were very patient in the face of my mistakes, and many would quickly increase their letter spacing if I didn't get their call the first time. No doubt a few (reasonably enough) got impatient and wandered off before I worked them, but that's fine. I predict I'll come last :-). SOAPBOX: frequencies get a bit packed. You have to take a look at this blog. http://m0cgh.blogspot.com/ The images and constructions are simply great. The comment I had from Colin was..." I have just started to do a blog ... I've never done a blog before, so I'll just have to see how it goes." 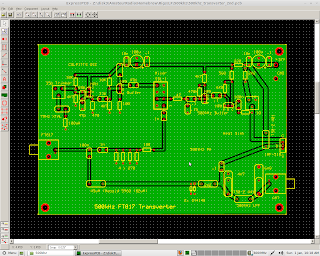 I made a start on a N2PK VNA last night. I had a spare PCB and parts from a group buy back in 2005. Just a couple dozen of the discrete C fitted so far. I have a new PC motherboard arriving tomorrow for a quad CPU I have and the motherboard has a native LPT port and COM port and I will build the system just for the test bench as I will also run a digital oscilloscope and other various com and lpt based test kit with it. I also have the newer N2PK V5 PCB http://www.makarov.ca/vna_v5.htm arriving soon which has a second detector and can plug into a USB port. I'll build up both versions side by side and probably compare them... then apart from the other builds I really must advance some more on the PIC-A-STAR's. Going to have a bit of fun with a rockmite kit I have unfinished. 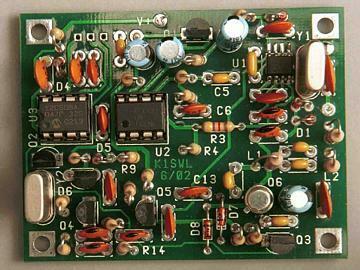 I think it is 20m but might be for 30m I have the SCAF filter boards with it too. I'm going to play about with the pa and see what is possible. Then time to play with what a PP3 battery can do with a rockmite. I'll update this post or create a new one with the results. Note I added shrink wrap to the multiturn resistor connections. I bought a whole box of random pots and multiturn pots at GQRP Rishworth 2011 and this is a 20k 10 turn Bourns pot. The VXO mod is from KE2SP. The details are on the rockmite yahoo group but here they are as well. These two images are the board before and after modification. The MV1662 varicap... don't discard it they are like hens teeth. The 5V1 zener you should save and use again another time. The pads on the AF sound chip do not have to be round I have used two 5mm pads but small square off cuts of pcb also work. 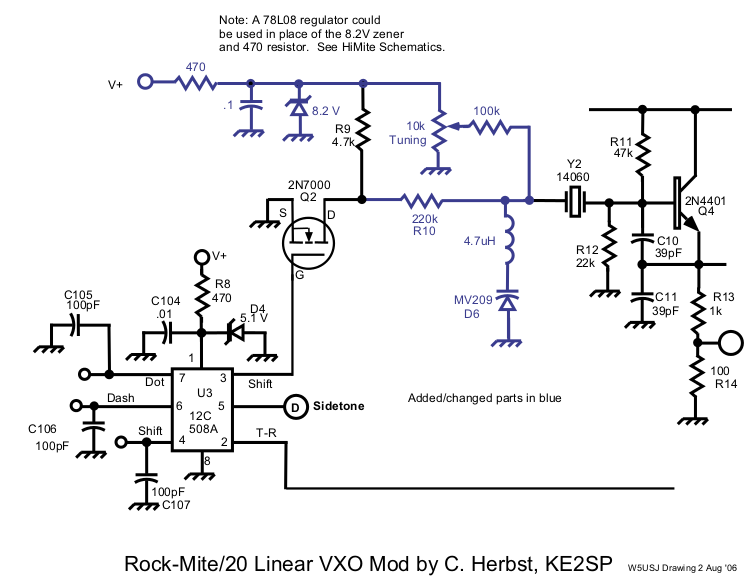 The 220K resistor, you can just add a 120K in series with the 100K that is already there. After a visit from Johnny SM7UCZ and some exchanges and after santa brought some components (IC,FET and Zeners) I am going to build one of his DC-DC converters for /P valve trips. Note I have used TO220 with mounting holes but I'll not etch them or drill them and will solder the tab to the boards. I will use plastic D cell holders and a 30VA transformer I bought from Farnell and I have a big 470uF 450V electrolytic already. Just before xmas the parts and the specially wound transformer arrived along with a PCB that needed to be drilled so just finished drilling the PCB. Dad suggested I need to make a metal brake/bender so that I can work with sheet aluminium (and steel) so ill make up a case for the valve tester. Johnny (SM7UCZ) also suggested a double triode tester as well. I bought a couple kits from Sunil http://cqbitx.blogspot.com/p/buy-digital-dail-kit-05.html a while ago and I have just made up the three kits. I'll be using one as a bench frequency counter and combined function generator (XR2206) as I bought a couple XR2206 IC from ebay over xmas. 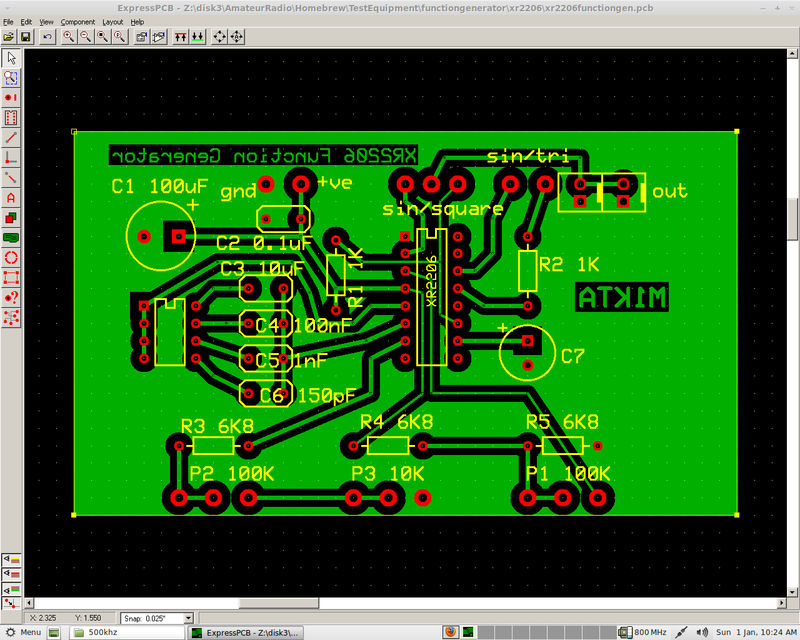 Another I'll use with an LTC1799 IC which is a simple signal generator. To which I will add attenuation on the output. 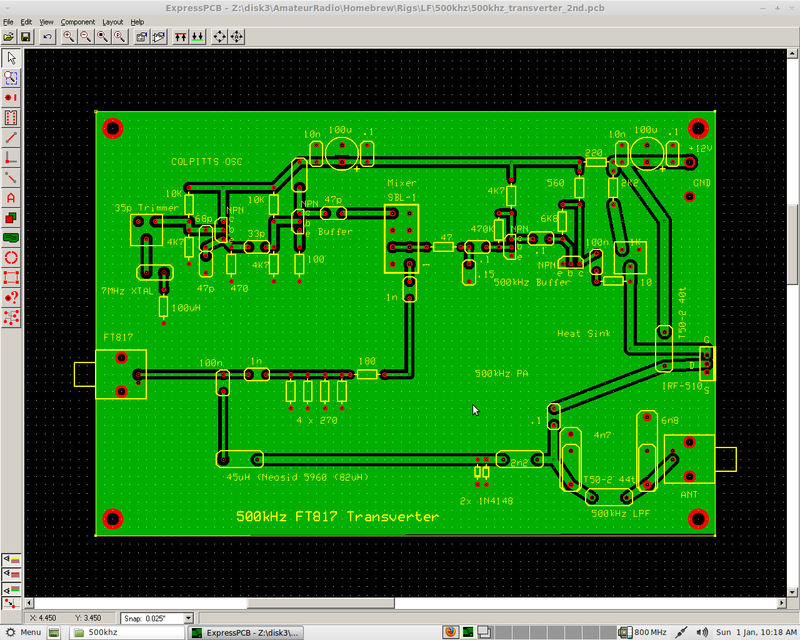 It will product almost 5V p-t-p square wave. The last will go into a Norcal40A kit. Back on this again and just finished it. 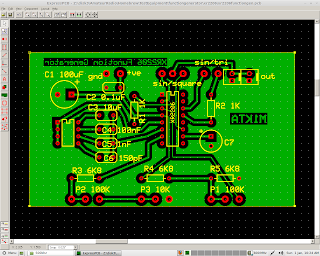 I went with a 7MHz LO and SBL-1 mixer very similar to G3XBM layout but I made a PCB for it. I picked up a T1 that someone built at a rally a while back but was stated to be not working cost me £10. If really was dead I could use the L match network. 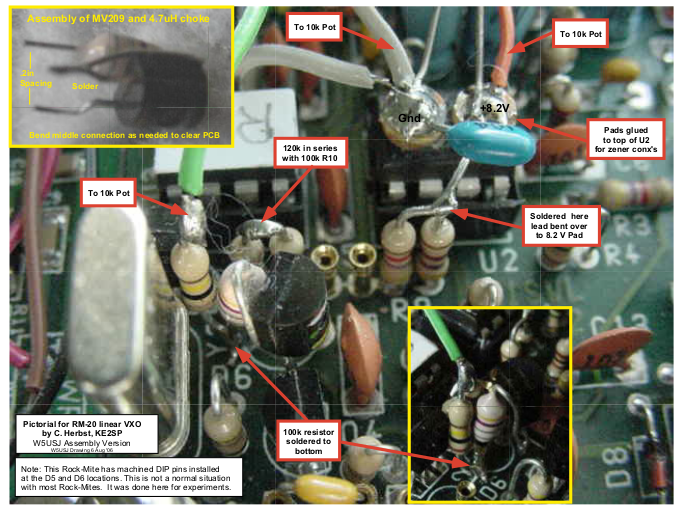 Apply power (with PIC removed) and the regulators appear to be applying the correct voltages etc..
bridges or missed solder joints. drops to between 117 K-ohms and 135 K-ohms. The LED do not light up. And the diode tests fail. Also for starters I had removed the switch bord from the uPC and relay board underneath for the first set of tests. J4 is the connector on the left side of the T1 control board. J5 is the connector on the right side of the T1 control board. You can test this at J4 pin 3, which is the pin just above and between the green and yellow LED, and it is the 3rd pin when counting beginning with the round pin 1 of J4. U1 pin 1 and J4 pin 3 are directly connected together. Remember that J4 is on the left side of the control board. Be sure U2 and Q1 are not swapped with each other. Be sure R7 is 120K and R14 is 3.3K. 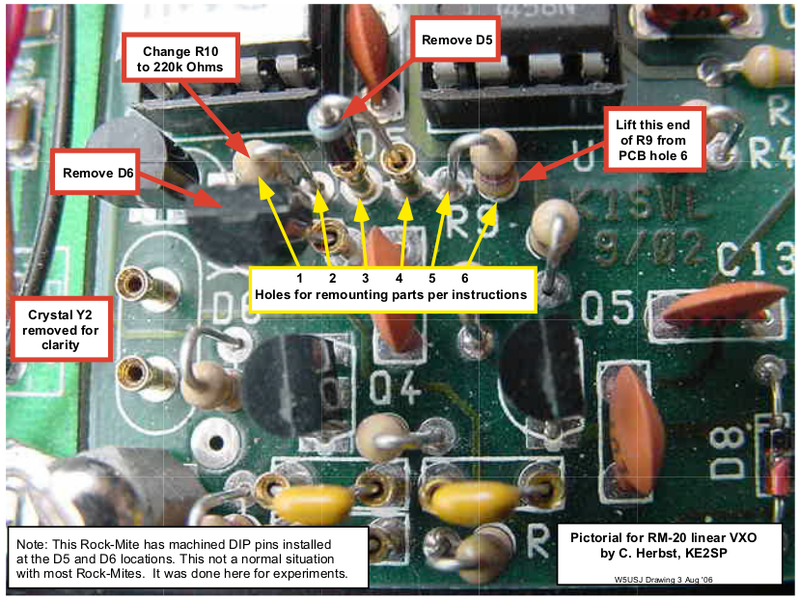 You can use an ohmmeter to check for any shorts between the connector pins and ground with the battery removed, and between any pins of the parts and a nearby connection that is not at ground. Note some connections are intentionally grounded. 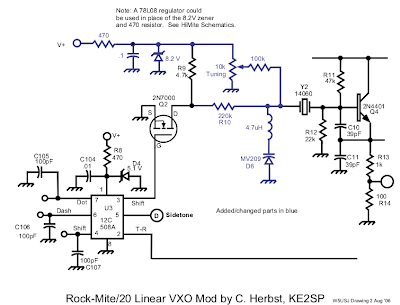 Use the schematic as a reference for these tests. You can find an accidental short circuit or solder bridge this way. First remove the 9V battery. Then place the positive test probe on the anode connections for each LED at pins 1, 2, or 5 of the J5 connector, and the negative lead on the common cathode connection at either end of R9. J5 is the connector on the right hand side of the tuner as you would normally face the top and front of the PCB (near R21). Pin 1 is the round pin near the battery compartment. 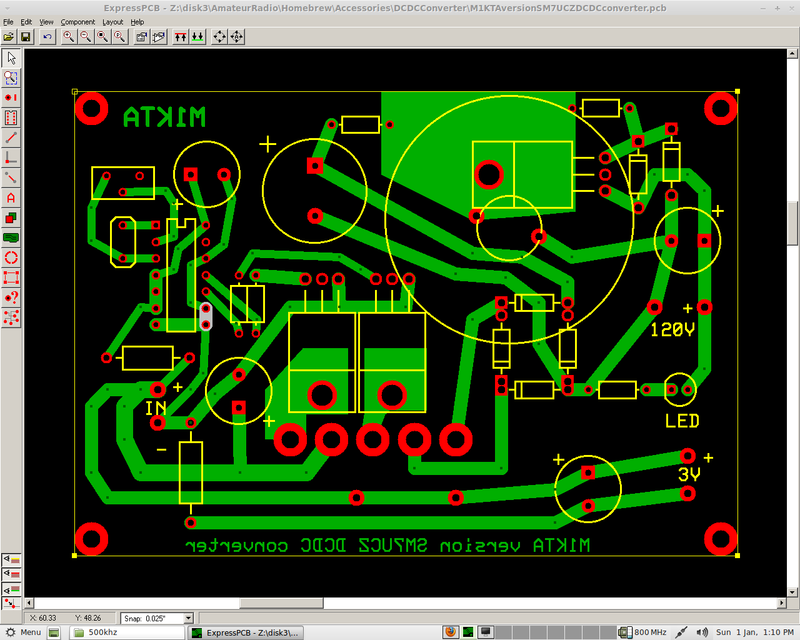 R9 is near the left top edge of the T1 control board. Each of the LEDs should light enough to be seen in a dimly lit room as you move the positive probe to J5 pin 1, 2, or 5 and hold the negative probe on R9.